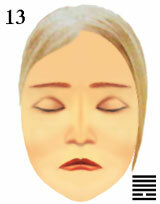 Gallery of emotions for facial images of a woman. If face of a woman expresses sad emotions then it is impossible to change her emotional image, namely it is impossible to alter facial appearance and to create "joyful mask", as such cosmetic make-up will contradict nature. Quiet eyebrows and eyes seem dismal as mouth expresses sad emotions. Sad mouth seems calm as eyes and eyebrows express quiet emotions. The person is sad because gloomy feelings grieve quiet eyes and ideas. The person refuses desires and thoughts as feelings are sad. facial emotional image of a woman for cosmetic makeup.